Videos, examples, and solutions to help Grade 1 students learn how to model subtraction of 8 from teen numbers. 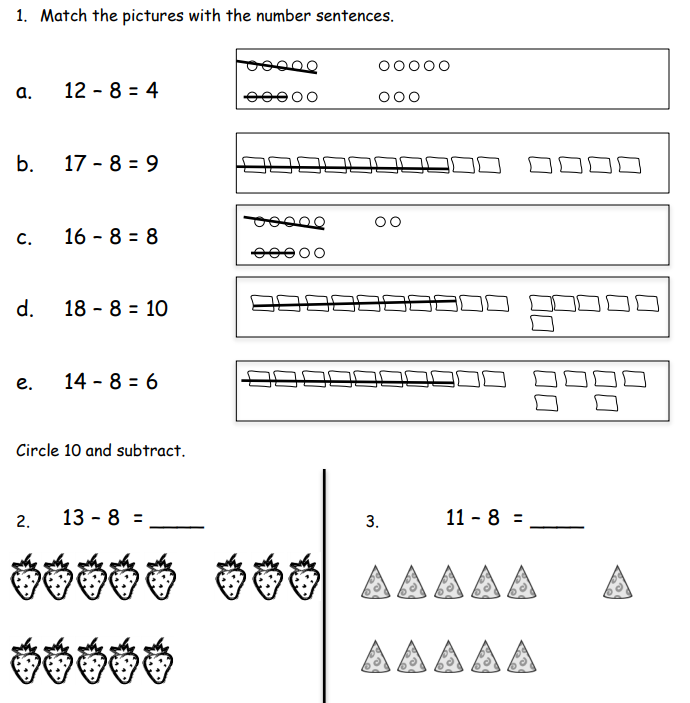 The following is the worksheet for Grade 1, Module 2, Lesson 17. Scroll down the page for examples and solutions. Draw and circle 10, or break apart the teen number with a number bond. Then subtract. 2. Show how you would solve 14 - 8, either with a number bond or a drawing. Draw and circle 10. Then subtract. 4. Lucy has $12. She spends $8. How much money does she have now? Draw and circle 10, or use a number bond to break apart the teen number and subtract. 5. Sean has 15 dinosaurs. He gives 8 to his sister. How many dinosaurs does he keep? Make a math drawing of a 5-group row and some ones to solve the following problems. Draw 5-group rows and cross out to solve. Write the 2+ addition sentence that helped you add the two parts. 1. Annabelle had 13 goldfish. 8 goldfish ate fish food. How many goldfish did not eat fish food? 3. There were 19 turtles swimming in the pond. Some turtles climbed up onto the dry rocks and now there are only 8 turtles swimming. How many turtles are on the dry rocks? Find the missing number by drawing 5-group rows. 8. Draw 5-group rows to show the story. Cross out or use number bonds to solve. Write a number sentence to show how you solved the problem. There were 14 people at home. 10 people are watching a football game. 4 people are playing a board game. 8 people left. How many people stayed? 2. Sam collected 15 buckets of rain water. He used 8 buckets to water his plants. How many buckets of rain water does Sam have left? Sam has ____ buckets of rain water left.